DOLLS are seductive, silly, and semi-psychedelic on their new track “Pink Bones.” The mid-paced pop-punk-tinged indie rock song sees Nick Cave and the Bad Seeds’ drummer Jim Sclavunos producing a colorful number. The UK two-piece set the pace with a grungy song that also brings about so much of the energy of early 2000’s indie rock. “Pink Bones” fits alongside many of the other gritty and energetic pop-punk bands like Diet Cig, Long Neck, and early Japandroids, but DOLLS also throw in some sensible nostalgia that helps set them apart. 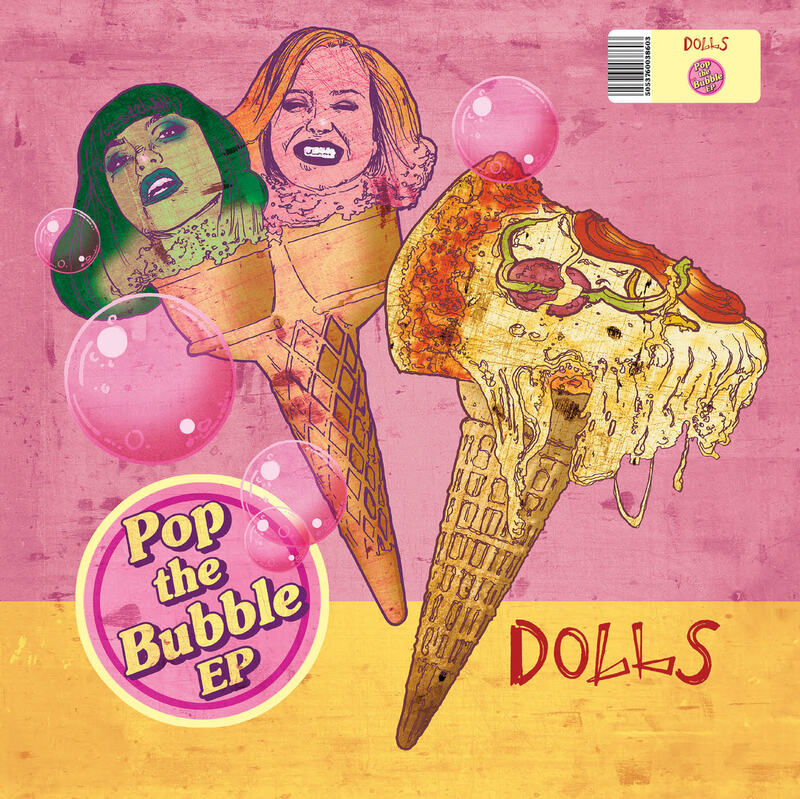 Atwood Magazine is proud to be premiering “Pink Bones,” the latest single off DOLLS’ upcoming Pop the Bubble EP (out September 21, 2018 via Mondo/Death Waltz). Jade Ellins and Bel Conde share vocal duties and create an entire sonic space with just their voices, Ellins’ guitar, and Conde’s drums. Despite the minimalism of their instrumentation, Conde’s extra-tight drumming, paired with Ellins’ quick shifting guitar parts, creates a wider dynamic making them sound more expansive than some of their two-piece contemporaries who don’t explore nearly the same amount of space as they do in under three minutes. The band that comes to mind the most when listening to DOLLS is the Yeah Yeah Yeahs. The strict rhythms, massive amount of parts, and dirty glamor make DOLLS sound like they could be opening for the Yeah Yeah Yeahs at the Mercury Lounge in 2003. Both Ellins and Conde’s vocals mesh together in such a way as to make “Pink Bones” sound like it could be Karen O a la Fever to Tell singing on it. Conde’s description of a “dystopian reality” brings up the post-apocalyptic scene of the day after a party. Whether they’re talking about Viagra, guns, or cream soda, their words are easily applicable to various scenarios. Even the chorus, “I’m nothing but pink hair and bones,” is a suitable description of a hangover. “Pink Bones” is a fun and honest song. Bel Conde and Jade Ellins bring a minimalist approach not only to this track, but also to the entirety of their Pop the Bubble EP. It allows the listener to pin the picture they paint to whatever background works. Stream DOLLS’ latest single, exclusively on Atwood Magazine!